Join us on Independence Day, July 4th at 3 PM as Arts Express celebrates the birth of our nation. The 31st annual patriotic spectacular“Let Freedom Sing” will be presented at Centennial Hall on the U of A campus at Park and University. 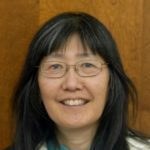 The program will feature the Arts Express Choir, Orchestra and soloists under the direction of Dr. Joan Ashcraft, Co-Artistic Director of Arts Express. The production will highlight inspiring stories that demonstrate Americans’ commitment to country and freedom. The Davis-Monthan Honor Guard will post the colors, and each branch of the military will be recognized during a special Salute to the Armed Forces. 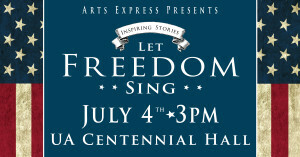 We hope to see you and your entire family on July 4th at 3 PM at Centennial Hall for Tucson’s long-standing tradition, “Let Freedom Sing” presented by Arts Express. Group discounts for groups of 10 or more are available. Please call (520) 319-0400 for more information. Previous articleJim Webb for president? Seriously?